One of the recommendations of the ACCJC is for the Chancellor and Trustees to work together to support student success. If you recall, the District had Eight Recommendations from the 2015 ACCJC Self Study. Recommendation Seven required that the Governing Board and the Chancellor work together “to assure the quality, integrity, and effectiveness of the student learning programs and services and the financial stability of the institution.” Since that time, we have conscientiously strived to engage in a positive working relationship and to live up to our charge. We continue to take ACCJC’s Recommendations seriously as we continue to review our work and to make improvements. Chancellor Laguerre also informed the Board that he has refocused his goals to help us attain greater success for our students. Board members accepted his proposal. Chancellor Laguerre indicated that concerted efforts will be made to help improve the District Administration Center’s service to the Colleges and the public that interacts with us as vendors, suppliers, grantors and benefactors. Attention to these efforts– coupled with the fact that we live in an area that is becoming less and less affordable to live with ease– requires us to think strategically about how best to help those at the lowest levels of compensation do better financially. We are committed to demonstrably support greater student success at Peralta and to ensure that our efforts are visible. The Peralta Community College District’s Board of Trustees, at its annual organizational meeting held on December 12, 2017, elected new officers for 2018. Meredith Brown representing Area 2, was elected President, and William “Bill” Riley, who represents Area 5 was elected Vice President. Jowel C. Laguerre, Ph.D, Chancellor of the District, was elected Board Secretary. Outgoing president, Julina Bonilla, who represents Area 7, and Trustee Brown, who served as Vice President in 2017, were honored for their service at the meeting. Bill Withrow (Area 1), Linda Handy (Area 3), Nicky González Yuen (Area 4), Karen Weinstein (Area 6), Julina Bonilla, (Area 7), and Student Trustees Corey Hollis and Nesi More continue to serve on the nine-member governing board. “I look forward to continuing Peralta’s work to raise the retention and graduation rates of our under-served students, improving our educational facilities and improving the delivery of services to our Peralta Community,” President Brown said. President Brown was elected to the Peralta Board of Trustees in 2012 and has an extensive background in community service, including providing training for California community colleges and K-12 institutions on immigration in the educational setting and maintaining a welcoming educational environment for all students regardless of immigration status. She is also active in promoting student success and student support programs for students who are under-represented in higher education. President Brown’s volunteer work also includes providing training on best practices for supporting and recruiting faculty members from diverse backgrounds, on sexual harassment, on dual enrollment, which provides high school students and students who are under-represented in higher education with the opportunity to take community college courses for dual high school and college credit while in high school, as well as trainings on trustee fiduciary responsibilities and fiscal oversight. 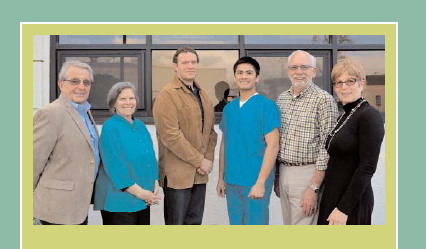 In addition, President Brown is a volunteer member on the Peralta Colleges Retirement Board. She is a graduate of Cornell University and also graduated from Boston University School of Law. President Brown has worked as a literacy volunteer for the Super Stars Literacy Program at Hoover Elementary School and served as a delegate at the 2008 Democratic Convention. She has also been active in raising awareness of the importance of early childhood education by working on the Alameda County Pre-School for All Campaign and working on a community task force for our local assembly representative. William “Bill” Riley was first elected to the Board of Trustees in 1998 and represents an area that includes Oakland’s Rockridge District and the City of Piedmont. He has served as President of the Board twice and also as Vice President. He is a Merritt College alumnus and has served in public education over 30 years, including the Oakland, East Palo Alto/Ravenswood and San Ramon School Districts. He earned an Ed.D., in Educational Policy and a B.A. in Sociology and Physical Education from the University of San Francisco and an M.A. in Educational Administration from San Francisco State University. At its meeting on Tuesday, January 24, 2017, the Board of Trustees for the Peralta Community College District approved the appointment of Jason Cole, Ph.D, to serve the new Vice Chancellor for District-wide technology services. Dr. Cole begins in his new position February 1, 2017. “I am very pleased that we have worked hard to find an individual like Dr. Cole to bring to our Colleges and pleased that he is the final choice for Vice Chancellor of Information Technology,” said Peralta Colleges Chancellor Jowel C. Laguerre, Ph.D.
“Dr. Cole has the skills needed to transform our IT Department. His background in technology, education and leadership will allow him to take District IT to the highest level possible,” the Chancellor said. Jason Cole is a long-time educational technology leader with experience in K-12, higher education and corporate environments. He has more than 20 years’ experience in the implementation of large-scale technology projects and instructional systems design. 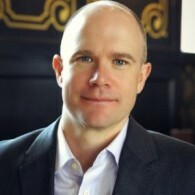 Dr. Cole is the former CEO and current Board Chair of Remote-Learner, Inc., a Moodle service and integration provider. As CEO, he led the transformation of Remote-Learner’s services and operations, providing technical services to over 1,000 clients – from small non-profit organizations to community college districts and Fortune 500 companies. Before joining the private sector, Dr. Cole was a Product Development Manager at the Open University in the UK, where he and his team won the Mellon Award for Technology Collaboration. As the Academic Technology Manager at San Francisco State University, he was responsible for the strategic implementation of campus-wide learning technology initiatives and faculty support. A recognized leader in educational technology, Dr. Cole is the author and co-author of several books and articles on education and technology, including Using Moodle from O’Reilly Press. He has been an invited keynote speaker at several education conferences and MoodleMoots. He received his Ph.D. in Educational Technology from the University of Northern Colorado and his B.A. in Environmental Conservation from the University of Colorado Boulder. 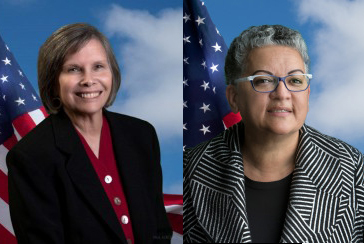 The Peralta Community College District’s Board of Trustees, at its annual organizational meeting held on December 13, 2016, swore in a new Trustee, Karen Weinstein (Area 6), pictured left, and also three reelected Trustees, Meredith Brown (Area 2), Bill Withrow (Area 1), Nicky González Yuen (Area 4). In addition, the Board elected new officers for 2017. Julina Bonilla, representing Area 7, pictured right, was elected President, and Meredith Brown was elected Vice President. Jowel C. Laguerre, Ph.D, Chancellor of the District, was elected Board Secretary. Outgoing president, William Riley, who will continue to represent Area 5, and Cy Gulassa, retiring Trustee who represented Area 6, were honored for their service at the meeting. Student Trustees Dave Ivan Cruz and Marquita Price will also continue to serve on the nine-member governing board. “I am extremely honored to serve the Peralta community and look forward to cultivating high quality educational programming and training for our students,” said President Bonilla. President Bonilla is a Solano Community College graduate and received her B. A. from U. C. Berkeley. She is a former Oakland elementary school teacher and eventually moved into workforce development providing education and job training to young adults in Northern California. Her community work and active memberships include serving as the Board President of Tradeswomen Inc. and in the National Women’s Political Caucus-AN. She has served as a member of the Oakland Workforce Investment Board and co-chair of the Oakland Youth Council. Currently, she is the Program Director of the West Oakland Job Resource Center. She was first elected to the board in 2014. Vice President Brown was elected to the Peralta Board of Trustees in 2012 and has an extensive background in community service, including working as literacy volunteer for the Super Stars Literacy Program at Hoover Elementary School and serving as a delegate at the 2008 Democratic Convention. In addition, she is active raising awareness of the importance of early childhood education by working on the Alameda County Pre-School for All Campaign and working on a community task force for our local assembly representative. Brown is a graduate of Cornell University and also graduated from Boston University School of Law. Karen Weinstein, who was elected to fill retiring Trustee Gulassa’s seat, has served on the Peralta District Citizens’ Oversight Committee, is a Board Member of the Berkeley Public Schools Fund and is Vice-Chair of the Berkeley Commission on the Status of Women. Trustee Weinstein serves as Co-Chair of the California Democratic Party’s Affirmative Action Committee and is a member-elect to the Alameda County Democratic Central Committee. She also serves as community liaison for the Dreamers and Undocumented Student Task Force. Trustee Weinstein received her Ph.D. in Counselor Education, with a concentration in college counseling from the School of Education, State University of New York at Buffalo. She is a Licensed California Psychologist. 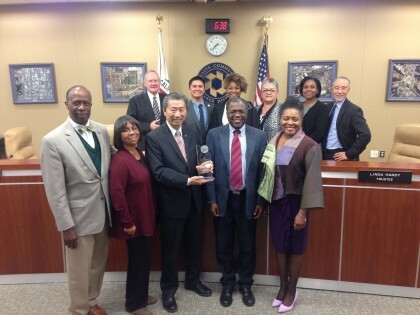 At the Peralta College Board of Trustees meeting on February 23, 2016, Henry Chang, President of the Laney Tennis Association, presented the four-college district with the Association’s award for national recognition as “Organization of the Year” by the Northern California branch of the United States Tennis Association. 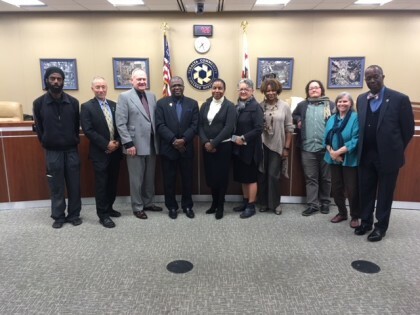 The Peralta Trustees welcomed the award and noted that previously, Jowel C. Laguerre, Ph.D., Chancellor for the Peralta Community College District, was on hand to acknowledge the Laney Tennis Association’s award during the USTA Northern California 2016 “Awards Celebrating Excellence in Service (ACES) Luncheon” that took place on January 31, 2016, at the Casa Real at Ruby Hill Winery in Pleasanton, California. A staple of the tennis community in Oakland and the surrounding area, Laney Tennis Association has grown from a small group of friends to hundreds of members. The association, housed at Laney College and College of Alameda, and directed by the husband-and-wife team of Henry and Connie Chang, embraces beginner-level members and works to keep tennis accessible to all who want to play. Laney Tennis Association is the embodiment of a community tennis association in its goal to create a close-knit, family atmosphere based on the benefit of playing tennis. The pioneers of the Laney Tennis Association have grown the game of tennis through their coaching, specializing in beginners with good basics, and their love of the community in Oakland. Henry Chang, a former member of the Oakland City Council and former Vice Mayor of Oakland, along with his wife, Connie, who is Secretary/Treasurer keep growing Laney Tennis, creating new opportunities for its players, not only in developing their skills, but also using the game to travel abroad, stay healthy and, above all, create new friendships. “This was a proud experience for all of us to have accepted the honor and to witness our District recognized for its work with the community,” said Jowel C. Laguerre, Ph.D., Chancellor of the Peralta Community College District. “I would like to thank Dr. and Mrs. Chang for all that they have done for our colleges and our tennis players throughout our community. It is really an honor to have LTA as part of the Peralta Family,” Chancellor Laguerre added. The Laney Tennis Association, which is a 501c3 Tax Exempt organization, recently moved to a new home at the College of Alameda while construction takes place at Laney College. The United States Tennis Association is the national governing body for the sport of tennis and the recognized leader in promoting and developing the sport’s growth on every level in the United States, from local communities to the crown jewel of the professional game, the US Open. USTA Northern California proudly honors those who work to promote and develop the game of tennis with the ACES, which are presented each year to celebrate players, program participants, volunteers and organizations for their continued commitment and service to tennis. The award for “Organization of the Year” is bestowed upon a USTA Nor Cal member organization for it’s service to the tennis community, for service to its own membership or constituency and for service to the game of tennis. At its regular meeting on January 26, 2016, the Board of Trustees for the Peralta Community College Districted nominated fellow Board member Cy Gulassa, Area 6, to serve on the California Community College Trustees (CCCT) Board of the Community College League of California (CCLC) for 2016. Gulassa, a long-time advocate for California’s community colleges, has been a trustee at the Peralta Colleges since 2004. A graduate of UC Berkeley with a M.A. in English, Gulassa has taught at institutions such as Frostburg State University in Maryland and the Philadelphia College of Art, as well as teaching English at De Anza College for 30 years. He served as president of the Foothil-De Anza District Faculty Association for fifteen years and founded the Bay Faculty Association. He lectures on community college reform and governance issues and has published over 150 articles. In 1994, he was named Faculty Member of the Year and was honored by State Assembly and Senate resolutions, and a commendation from President Clinton. The CCCT Board helps make policy for the CCLC and advances public education with legislative and public support for community colleges. It provides education, information and help to California community college governing boards and supports community colleges throughout the state. “CCCT is seeking wider membership on national trustee organizations and has won the right of trustees to serve on accreditation teams, a major step forward,” he added.